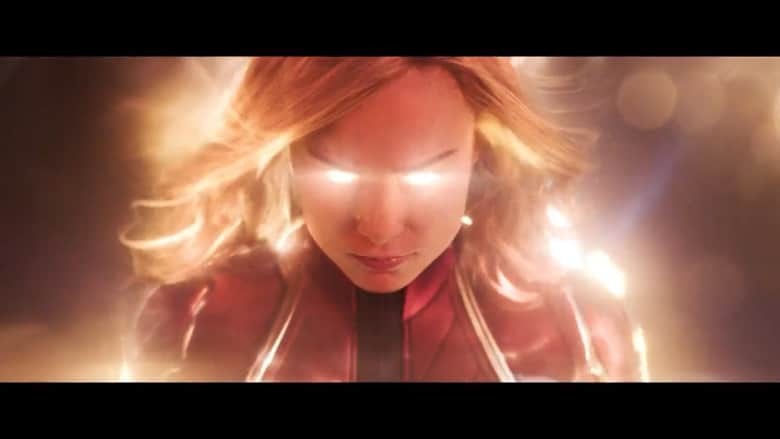 Captain Marvel Trailer Has Arrived | Nerd Much? Brie Larson joined Good Morning America this morning to introduce the world to Marvel’s next blockbuster in next year’s Captain Marvel. The era is set immediately within the Captain Marvel trailer. The movie is a period piece taking place mostly in the ’90s. It’s quickly noticeable as Danvers comes crashing down from the sky and lands right in the middle of a Blockbuster Video store. I’m assuming this is her return to Earth after an extended stay off planet. She looks around the store with a sense of unsure familiarity. Samuel L. Jackson’s Nick Fury narrates the Captain Marvel trailer. We get a glimpse of the character early on too. He’s dramatically younger, and Marvel did a fantastic job de-aging the actor much like they did Robert Downey Jr.’s Tony Stark in Captain America: Civil War. It seems that Fury finds Carol Danvers shortly after she returns to Earth with her powers. He looks as though he’s mentoring her through her re-acclamation to the planet. She explains that she “keeps having these memories.” “I see flashes. I think I had a life here, but I can’t tell if it’s real” she says. During this period of the Captain Marvel trailer, we see Carol before she went to space and earned her powers. Going through her Air Force training, playing softball and being at the beach as a child. But she’s unsure if any of it happened due to the trauma she went through after leaving the planet. Which we see next as she’s imbued with her powers. We then get a bunch of flashes of several things. Danvers walking with her cosmic allies, the Starforce, and a quick shot of their commander in Jude Law’s Mar-Vell. Another shot of Carol as a child and then her as an adult piloting a fighter jet. We see Danvers viciously assault an elderly woman aboard a subway train. Which we can assume she’s doing because the woman is a shapeshifted Skrull. The Skrull’s are said to be the villains of the film, but in the first trailer they’re mostly absent. We’re given a quick (and glorious) shot of Clark Gregg’s return as a younger Phil Coulson. More glimpses of Danvers’ past. A few snippets of her using her powers, likely for one of the first times. And then the money shot, Brie Larson in her traditional Captain Marvel red and blue garb going full H.A.M. It’s quite the spectacle. There’s a lot going on in the Captain Marvel trailer and it’s a little hard to keep up if you’re not well versed on the character. All in all, though, it was great first showing. The movie heads our way roughly 6 months from now when it premieres on March 8th.